From the initial meeting to the final installation, RCF Group takes care of every detail, allowing you to focus on the big picture. Our service doesn’t end when the project does. We’ll guide you through the evolution of your space as your needs and business requirements change, keeping your people productive and your space dynamic. We deliver a true asset management program by expertly managing your assets as well as providing secure storage. We will deliver a tailored plan to warehouse, maintain, and reallocate existing assets. 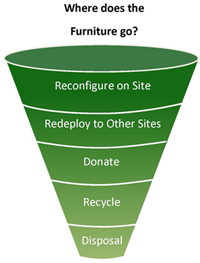 Our unique, “One Asset” approach minimizes cost and maximizes efficiency – we analyze your assets to determine what can be retained and reconfigured in house, we also create sustainable solutions for items that have exceeded your company’s lifecycle by selling, donating, or recycling them. Let our attention to detail, vast experience and management process alleviate stress for your next move. RCF Group's Move Management Services are designed to alleviate stress, pressure and cost from your current Facilities Management and Real Estate teams, while allowing them to focus on the facility and infrastructure rather than planning a move project. Our experts will make every effort to capture the most minute details to make moving smooth and trouble free. Our attention to detail, vast experience and management process will keep costs as low as possible without sacrificing quality or end user satisfaction. We help you create and maintain the landscaping image you desire for your facility without the hassle of day-to-day management. Our experts utilize the most up to date, practical designs mixed with knowledge and understanding of a variety of plants and what they have to offer. Once furniture arrives on site, it is important to have qualified, certified installation teams to receive and install the furniture. Our group of dedicated, manufacturer certified installation teams deliver a timely and seamless project installation. We provide the full range of planning and technical services needed to develop detailed, product-specific information that enables the transformation of design vision into a tangible workplace. Our goal is to combine the vision of our clients with in-depth product knowledge to create a flexible and adaptable solution for your business today and in the future. Our design team will work with you to create the space that works best for your company's culture. We create solutions using integrated design and specification tools, which all us to respond faster, easier, and more accurately to your requests by creating drawings and specifications simultaneously. Let us expand the life of your existing furniture with our refurbishment and repair program. We provide reupholstering of panels and seating, repainting of file units and desks and re-laminating a variety of work surfaces are all services we provide to renew your existing furniture for years of future use.